Motivator TV: Boost visibility, recognition, and fun. Motivator makes sure your sales team's success never goes unrecognized. 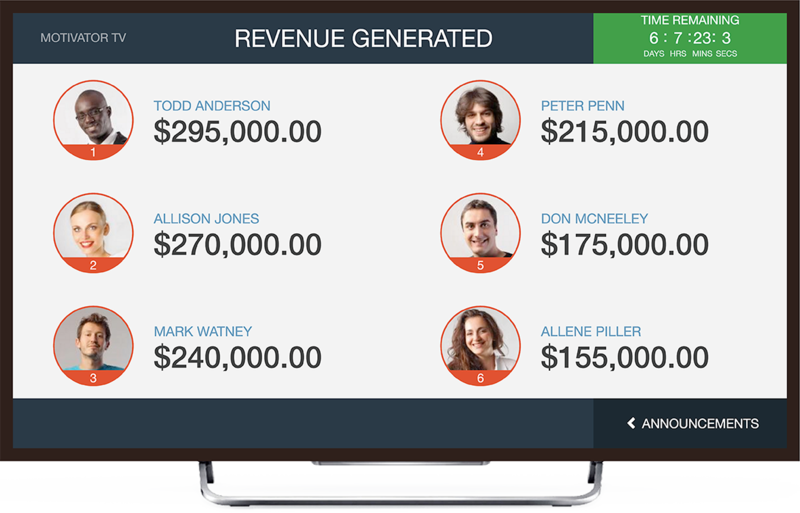 Stream sales activities on the big screen and watch your workplace come alive. Display KPI's, Targets, and Contests as a "snapshot" to show aggregate performance or as a "leaderboard" to compare team and individual performance. Engage your team by making the sales process fun, competitive, and immersive with multiple channels. Populate them with KPIs, targets, and contest standings. Customize Motivator TV exactly how you want it. Give your employees increased visibility of current sales conversions by adding the Pipeline Velocity Channel or motivate your sales team by showcasing leads they closed. Your sales team can observe the numbers and adjust their operations accordingly. Build a strong team culture across your organization by pushing team updates when they occur. Motivator provides a convenient, easy to see on-screen ticker that can display all your vital notifications on your TV. Ensure that contests resonate across your organization through recognition. Did your sales rep reach his or her target before the allotted time? Celebrate the occasion and make your employee proud by announcing the achievement on the big screen. You can also feature your channel by highlighting it with the top performers for the current contest.